Syllabus of the Online Course (Subject): Foreign Trade and Business in North Korea. Pyongyang. The course materials are available in or Corea del Norte Corée du Nord. Description of the Online Course: Doing Business in North Korea. All business in North Korea is done directly with the Government (state-owned companies). Kim Il-Sung ruled North Korea from 1948 until his death on July 1994. Foreign Trade of North Korea. North Korean Government controls all imports and exports, and formal trade is minimal. North Korea usually does not welcome Foreign direct investment (FDI). 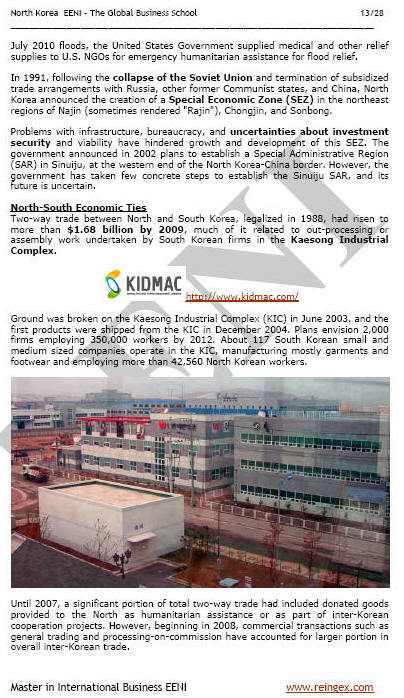 International Trade between the North and South Korea, legalised in 1988, had risen to near 1.68 billion dollars, much of it related to out-processing or assembly work undertaken by firms of South Korea in the Kaesong Industrial Complex. On July 2000, the Democratic People's Republic of Korea began participating in the Association of Southeast Asian Nations Regional Forum. The Democratic People's Republic of Korea also expanded its bilateral diplomatic ties, establishing diplomatic relations with Italy, the Philippines, Australia, Canada, the United Kingdom, Germany, and many other European Countries.